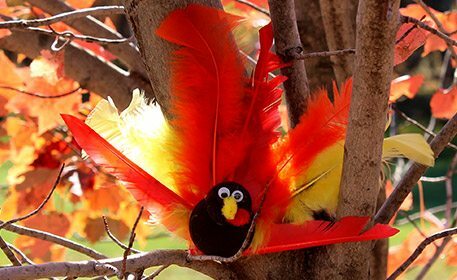 Upcycle bottle caps to put together an adorable Thanksgiving turkey! Add neon feathers for a fun look or use fall colors to keep it simple and sophisticated! Paint a small bottle cap and a large bottle cap brown. Cut a 1″ piece of red fuzzy stick and fold in half into a curve. Cut a 1″ piece of yellow fuzzy stick. Fold in half and curve the end to create the beak. Glue (2) wiggly eyes and the beak and snood (red fuzzy stick), as shown. Glue the small brown bottle cap to the large bottle cap. Glue colorful feathers to the back of the large bottle cap. Glue a small bottle cap to the back of the turkey so it stands up.